Martha Hughes's Pools & Gardens combines two distinct bodies of work, each addressing similar topics but with markedly different approaches. Hughes’ hard edge, color block paintings of pools, paired with her gestural drawings of gardens, demonstrate her wide range of ability, vocabu- lary and scale all while she continues to produce thematic conceptual content. Her paintings are carefully developed scenes of romanticized interiors and landscapes: views inspired by magazine spreads with overly staged photographs of impossibly pristine, impeccably beautiful houses, gardens, and pools. Hughes has stripped these down to their barest colors, distorting angles and proportions to fabricate the momentary uneasiness one can unexpectedly feel in familiar spaces. The flat, hard-edges are complimented by obvious brushstrokes, giving the work a sense of being both carefully made and personally handcrafted. Paralleling these geometric scenes are lush, impressionistic, watercolor and colored pencil drawings of private and public gardens. Hughes creates intimate slices of perfectly landscaped spaces that al- lure the viewer with a dreamy sense of hope and peace. These highly planned and cultivated manmade grottos also act as staged environments, asking us to become aware of our impacts as we move through the landscape. In both series, Hughes uses the environments humans create for themselves as a way to consider the lives we live. Whether they are naturalistic or minimalist, comforting or disorienting, her construct- ed surroundings challenge us to find a meaningful relationship with the natural world. 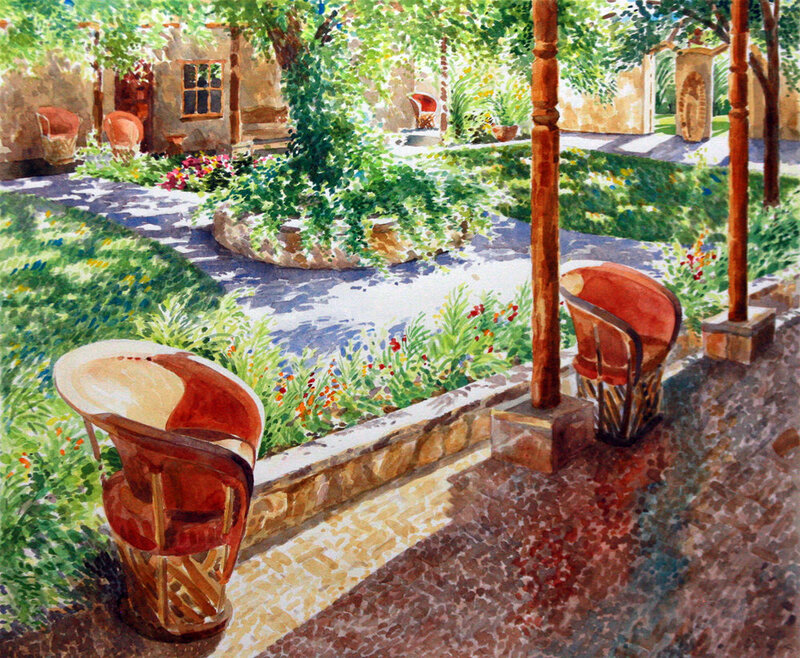 Martha Hughes received a BFA in Studio Art from the University of Texas at Austin. Her work has been included in numerous solo and group shows across the USA including exhibitions in New York, Texas, New Mexico and Colorado. Hughes works in a variety of mediums including painting, drawing, photography, and computer-based media. The artist has resided in Marfa, Texas, since 2004.